Last week, we finally got our hands on a prototype of the new VPL-PHZ10 WUXGA laser projector, Sony’s 4th generation laser projector (keep in mind that because it’s a prototype, it is not the final version of this projector). The VPL-PHZ10 is poised to shake up the current professional projector market – not just because it will be the most affordable high brightness laser projector, but because in many cases it will be at or below the cost of lamp-based projectors. If you take into consideration the long term or total cost of ownership of a lamp-based projector with lamps, filters, and the cost of getting technicians to make those changes, it puts this class of projector way out of reach of any conventional or current laser projector. $5,000 List Price – But will be available under $3,000 on the street! The Real Question: How does it Look? Both projectors had similar manual zoom lens functionality. 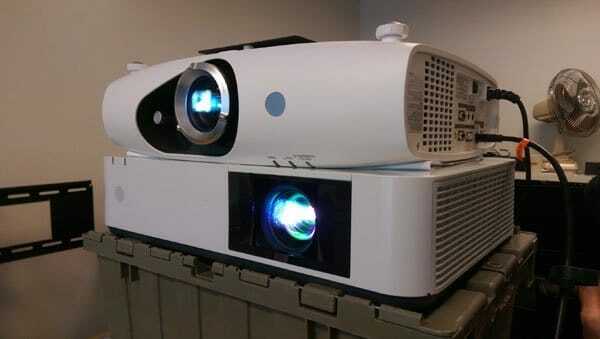 Comparing the two projectors, there is a visible difference between color accuracy. The single chip DLP color wheel sacrifices color for brightness. Even in it’s more accurate color setting, the NP-P502HL still does not rise up to the accuracy of the VPL-PHZ10 in reds and skin tones. The NEC NP-P502HL sacrifices color accuracy for brightness. The Sony VPL-PHZ10 displays more range and accuracy in skin tones. Although similar in some specs, the Panasonic PT-RZ570 is considerably heavier and larger than the Sony VPL-PHZ10. 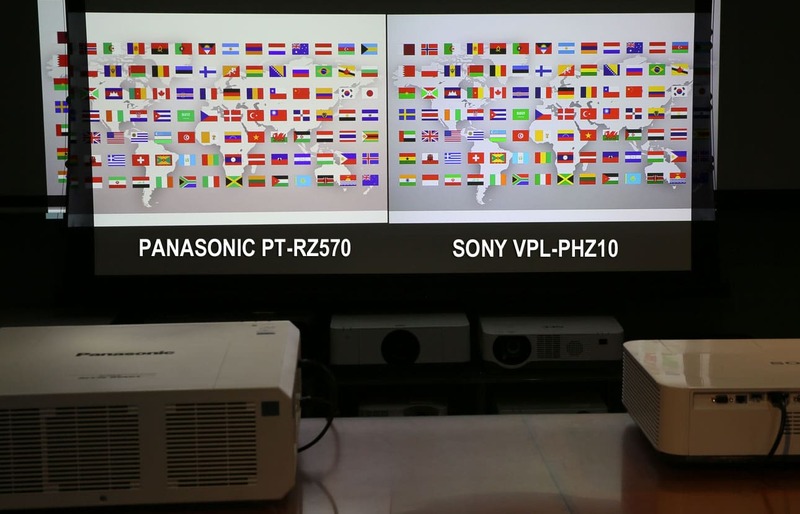 Color was more comparable between these two projectors (Panasonic has added yellow to their DLP color wheel). The fan noise on the Sony VPL-PHZ10 was quieter than the Panasonic. Pinks and reds were more comparable, but color accuracy was slightly better on the Sony. 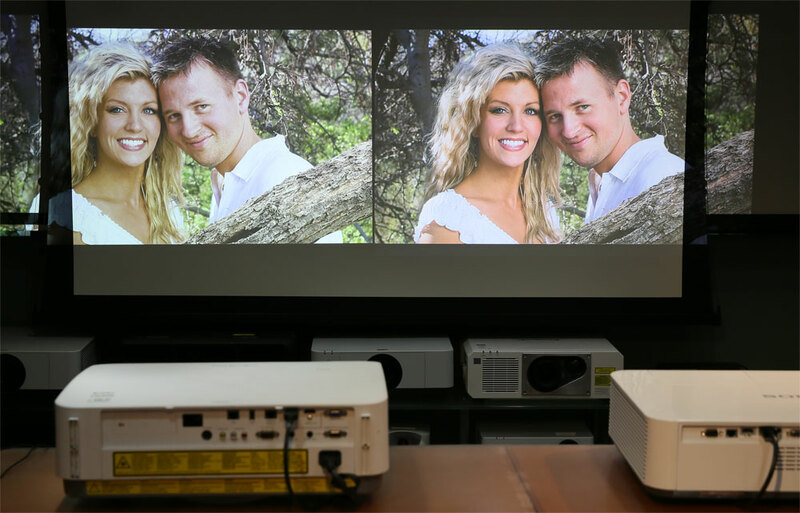 The Sony projector displayed better color gradient (however difficult to see in our video or stills). 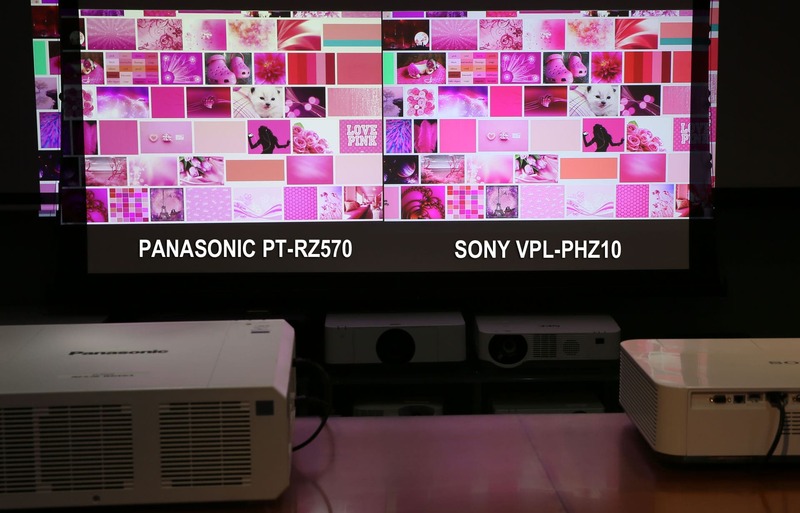 Pinks were vary close in comparison – but Sony VPL-PHZ10 appeared to have just slightly more accuracy. The Sony VPL-PHZ10 displays smoother transitions with color gradients (easier to see if clicked on). Overall, colors were very similar – just slightly different. Here is the Panasonic PT-RZ370U laying directly on top of the Sony VPL-PHZ10 – help help show size and style difference. We took the Sony VPL-PHZ10 to one of the local Universities to compare with one of their existing projectors. 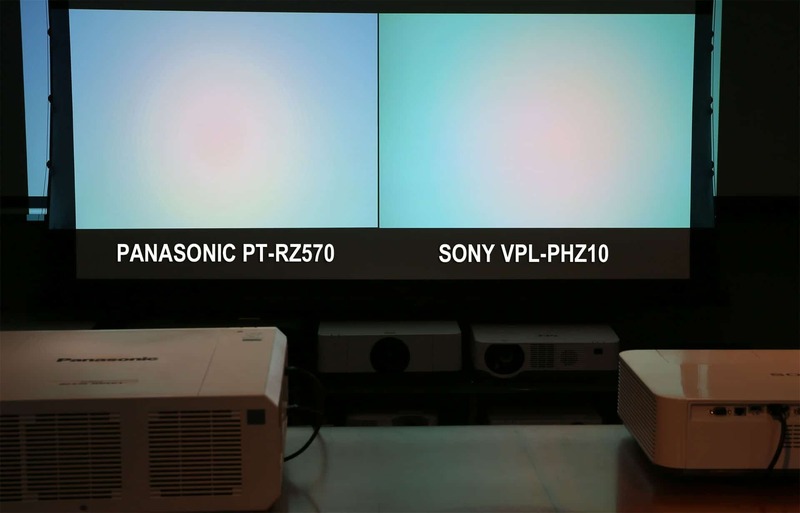 The PT-RZ370, as you can see, isn’t rated as high in lumens, so we expected the brightness to differ, but we were also clearly able to see the differences in color accuracy (slides were from a new disk that Sony brought). Brightness: We compared the new Sony to not only DLP laser projectors but also to other 3 chip LCD lamp and laser projectors as well. The Sony VPL-PHZ10 is definitely in the 5,000 lumen class. It’s also important to understand that even though it may test the same as a lamp based projector, laser light source projectors have a much more gradual fall off over time. So where a lamp base projector rated at 5,000 lumens may start new looking as bright – that brightness can drop as much as 20 or 30% within a few hundred hours.That means a 5,000 lumen laser projector could equal or exceed a 6,000 lumen lamp based projector with as little as 300 hours on it. Color: In our opinion this is where Sony really shines! Colors were balanced, accurate, and vivid. Most importantly, skin tones looked realistic. Many projectors still try and push their light output too high at the sacrifice of good skin colors, Sony does not. If anything, Sony is very conservative with their ratings. 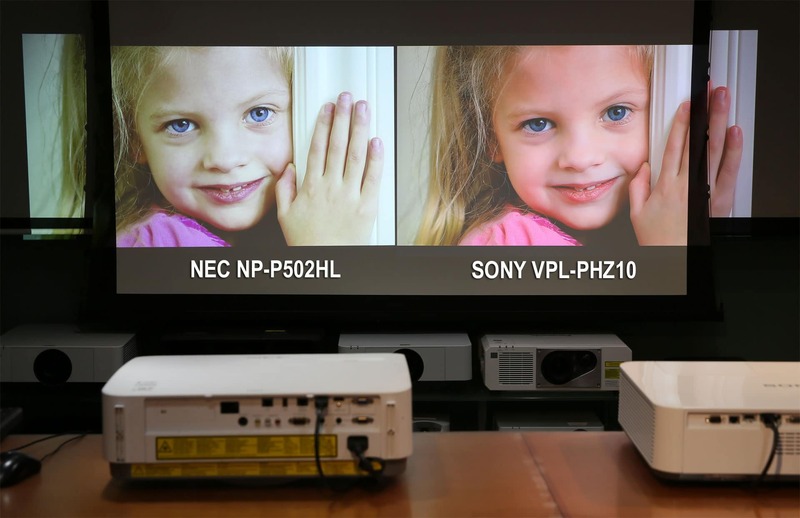 In comparison to 3 other laser DLP projectors we tested, none could equal the color quality and balance of the Sony. Contrast: Although 3 LCD projectors are not known for their black levels and contrast, this class of projector is usually used and intended for use in lights-on environments like classrooms and conference rooms. In that application the contrast was very good and even equaled the best of the 3 DLP laser projectors we compared in the 5,000 lumen class. White Balance: Good white balance is one of the keys to good skin tone reproduction and many times is overlooked by projector manufacturers. True white balance for video is at 6500 degrees and most computer monitors are a bit high close to 7500 or 8000 degrees. Sony seems to have figured this out (they are a motion picture company as well) and not only have a good middle white balance which works great for both videos and computers but a low and high for dedicated applications. Sharpness and Detail: Sony is all about detail. This projector has the same circuit that is in their more expensive laser projectors – with which we have much experience. It uses an internal database on a chip, called digital reality creation, which allows for almost 4K detail and sharpness. When we compare this to other projectors we have yet to find a projector that can exceed what the Sony can reproduce, it really is amazing. Auto Color Calibration: This new circuit can automatically activate after 500 hours of use and re-balances the white balance using RGB sensors inside the projector so white continues to stay white and skin tones look their best. Digital Reality Creation: This is the Sony original circuit, which uses a database containing 10 years of information, that sharpens and creates detail that we have seen no other manufacture beat. Whisper Quiet: There are no final specs yet, but in our comparisons this new Sony is significantly more quiet than any of its competitors. Auto-Cleaning Robotic Filter: This filter self-cleans so dust and dirt do not degrade the image over time. It also keeps the projector running cool and power-efficient. 5 Year or 12,000 Hour Laser Warranty: No maintenance and no worries for 5 years or 12,000 hours of use! 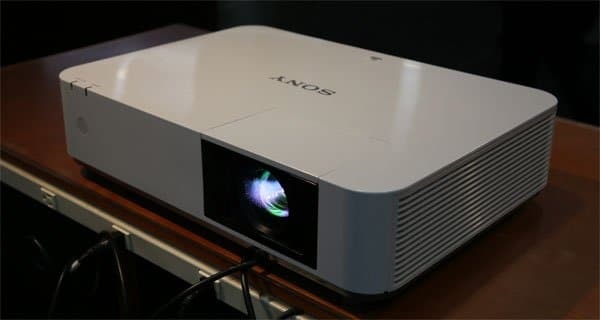 Extremely Fast Start Up: All lasers are faster than lamp-based projectors but this Sony is twice as fast as some we compared it to with images on screen in as little as 6 seconds, while some took as much as 18 seconds. Overall, we’re very excited about this projector and look forward to seeing the production version in June! This entry was posted in AV Solutions and tagged 3 LCD, brightness, business projector, classroom projector, color accuracy, DLP, gradient, laser projector, laser projectors, NEC, NP-P502HL, Panasonic, projector, PT-RZ370, pt-rz570, skin tone, Sony, vpl-phz10.